If there is one type of food Anguel and I crave most, it’s definitely Mexican. He’s sucker for tortilla anything, and me…well, avocado has a special place in my heart. Thankfully, Mexican food is like that old friend you can always rely on. It’s that meal you serve when you have a bunch of people over, that meal you make when it's just the two of you, the perfect snack when you're just feelin' a little taco, and that glorious feast when you're ready to chow down like nobody's watching. It's the last occasion I remember most fondly. About two years ago, Anguel and I decided it would be fun to do a thirty mile hike through Zion National Park. In one weekend. We were so excited about this impromptu vacation that we didn't spend much time thinking through how our flight / travel schedule left very little time for well, hiking. Oops. We had some other major oversights as well. Things like: it gets pretty cold in the desert at night. Sleeping mats are primo when sleeping on frozen ground – and no, it's not fun to share. Drug store vodka is not a suitable fuel substitute for camp stoves. Purel on the other hand works decently well, but unless you packed a liter in your bag, your freeze dried camp food isn't fluffing up anytime soon. Despite these set-backs, we finished the hike in two days and had the most amazing time doing it! By the end, we could barely walk. And our stomachs' had a hole that energy bars just couldn't fill, no matter how hard we tried. We celebrated by hobbling over to a dingy, small-town Mexican bar (Why? Because Mexican food + tequila = win). I don't think I've ever been so happy to eat overcooked rice and salty beans – it was a glorious feast. I was thrilled to have my old friend back. So what does this have to do with this recipe? Well for one, this recipe makes me almost as happy as that moment. 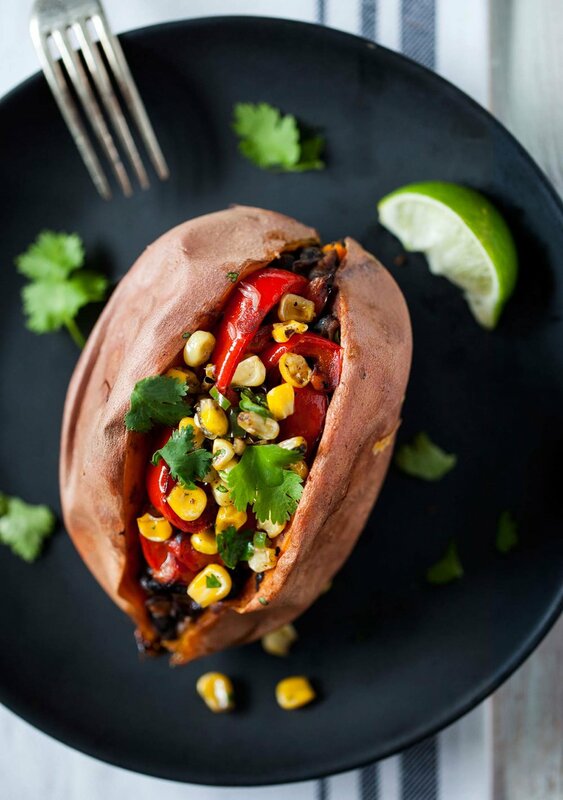 This dish embodies all the flavors I love about Mexican food, all stuffed into one cozy baked sweet potato. Because if there's one other food I'd take with me to a desert island, it would definitely be sweet potato. Beyond being one of the most beautiful tubers out there, sweet potatoes pack a powerful punch when it comes to nutrition. They're best known for being an epic source of beta-carotene. In fact, one sweet potato can provide up to 400% of your daily vitamin A needs! Holy guacamole, right? It's wise to cook your meal with a bit of fat where you can (like the oil in this recipe), because it helps with the absorption of fat soluble vitamins (like vitamin A). And as you'd probably assume, there's good stuff in the skin as well, so try to eat it as much as possible – and buy local and organic when you can. I recently shared a recipe that gets me really excited about the humble potato (recipe here). That said, because sweet potatoes provide more nutrients with fewer calories and a lighter glycemic load, sweet potatoes have a slight edge in our kitchen. What I really like about this recipe is that it utilizes a lot of "regular" ingredients. There's no need to go searching for special peppers or fancy sauces here – this one’s for those regular dinners when you don't feel like hitting up a grocery store on the way home from work. With the weather lately, I don't mind that at all. And despite the fact there are a few separate components to the dish, it still all comes together fairly easily. Once your sweet potatoes are roasting in the oven, you'll prepare the toppings. The black beans will get bathed in a warm bath of spices and seasonings. The peppers and onions will caramelize on the stove to develop that golden brown char. And we'll brighten things up with a bit of quick-sautéed corn and jalapeno. You can get as creative with the garnishes as you wish. I suggest avocado, cilantro and a squeeze of lime. This recipe makes enough for four servings. For us, that means leftovers – and let me tell you, on these cold winter days, there's nothing more exciting than digging into one of these babies for lunch or dinner! Cut a long slit into the top of each sweet potato. Try to make the incision 1/2"-1" (1.5-2.5 cm) deep. Extend the slit to the edges of the sweet potato, leaving 1/2" (1.5 cm) of space on either end. Place on a baking sheet lined with tinfoil and bake for 45 mins - 1 hour, or until the insides are soft. Use a medium sized saucepan to prepare the beans. Heat 1 teaspoon of oil over medium heat. Once hot, add the onion and garlic and saute for 3-5 minutes, until soft. Add cumin, paprika, salt and oregano and cook for 1-2 minutes, until fragrant. Add beans, vegetable stock and bay leaves. Reduce heat to medium-low and cover with a lid. Stir occasionally. Simmer for 25-30 minutes until most of the liquid is evaporated. While the beans cook, prepare the peppers and onion. In a heavy-bottomed skillet pan (ideally cast iron), heat oil over medium-high heat. Slice the red bell pepper and onion into long thin strips. Once the oil is hot, add both the peppers and onions to the pan. Cook for 15-20 minutes until the veggies are softened and developed caramelized brown edges. Adjust the heat as necessary to prevent burning. Once cooked, remove from the pan. Use the same pan for the corn (no need to clean in between). Heat up the oil for the corn over medium-high heat. While it heats, de-seed and dice the jalapeno. Add the corn and jalapeno to the hot pan. Saute for 3-5 minutes until lightly browned. Season with salt and pepper. Once the sweet potatoes are cooked, stuff them with a generous portion of your three toppings. It's best to start with the black beans (ladle on any remaining stock), then top with grilled peppers, onion and corn. Garnish with avocado, cilantro and lime wedges if desired.